A little while back I wrote about the new Shift game from the NFS guys. That game will be an order of magnitude better than any other game on the market thanks to helmet cam and a level of authenticity that made Vaughn Gittin, Jr think he had lost his mind. A photo of his car at a track he had never been to just couldn't register in his brain until he realized he was looking at a capture from the game and not an actual photograph. Now there's another reason to lust for this release: The new Pagani Huayra. The gang just released a new trailer for the game and it features the all-new, as-yet-unseen Pagani supercar moving through a variety of tracks and street circuits, through day and night action, from inside and out. I've embedded the video here and even if you only have two minutes left to live, I can't think of many better ways to spend it if you're a car guy. Make sure you have your speakers turned UP! Huge turnout again this week, which was nice as I've been gone the past coupe of weekends and really wanted to see a lot of great cars and bikes today. Got my wish and then some! 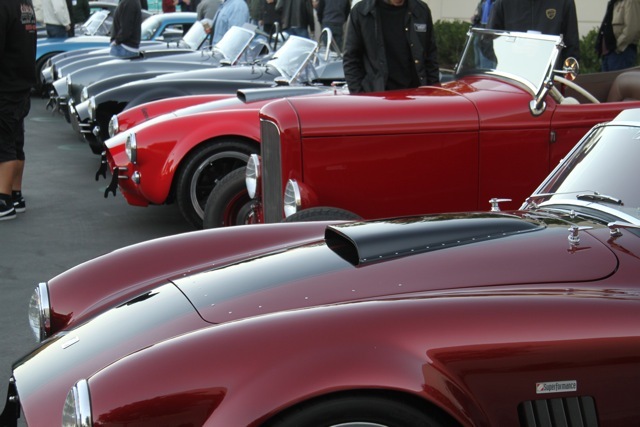 The Superformance Owners Group was having their annual get-together this week and showed up with a dozen or more Cobras, Daytonas and GT40s. Beautiful and iconic American cars one and all. It always cracks me up to hear them dismissed as kit cars by the uninitiated. When a car is designed and built using the original drawings, molds, parts..by the original engineers and designers - as these are in many cases - and factory built to this level of quality, it's hard to even mention them in the same breath as kit cars. But if it wasn't assembled in 1966, then it must be a kit, right? Anyway, about 3,000 people have realized over the years just how authentic an experience you can get in one of these at a fraction of what an original would cost you. Throw in the registry eligibility, customer service and extensive dealer network and these might be the retro ride bargain of the century. But I digress. Lots of cool Porsches, Benzes and Jags today, as well as a whole row of Hyundai Genesis Coupes, some great Audi R8s and a TT race car, Camaros, Mustangs, Lambos, Vettes, Ariel Atoms, Ferraris, NSXes, GTRs, Vipers, muscle cars, Beetles, and enough tiny British roadsters to keep an army of mechanics in the black for years to come. Some personal highlights included a giant red Packard, Cadillac CTS-V Coupe, 4-cam Porsche 356, 928 with its lights up, Perana Z-One, LS2 Jag XJ Coupe, Ford Popular, International Harvester Scout, PPI Razors, tangerine MGB GT, P&M C6RS, M-B F-Cell hydrogen runabout, KTM 1190 RC8, the blond handing out the fliers, and the Lancia Zagato!